While it might be easy to find a simple basket for holding goodies from the Easter bunny, how about a DIY version instead? Thinking outside of the average basket not only has a certain wow-factor but it also pulls double duty as a fun toy or display item that will last well past the holiday and is perfect for spring decor. While the sky’s the limit for this craft, here’s an easy way to make it yourself. There’s more than one way to recreate this playful Easter hot air balloon on your own, so see what materials you have around the house and if they can be tweaked to work for this project. See below for everything you’ll need and some possible substitutes. Get creative! Using craft paint in whatever shade you want, paint the outside of the wooden box until it’s completely covered. Don’t forget the top edge! If you’re feeling ambitious you can make the box two-tone or cover it with a pretty pattern, polka dots, or stripes. If you’re using a recycled carton for the bottom, you can paint or cover it with construction paper or felt. It’s completely up to you! Let the paint (or glue) dry completely so it can be handled before the next step. Place a paper straw in each corner of your box/vessel. Secure each in place with either washi tape or masking tape. Washi tape can add a pretty hit of color while masking tape will be a little stronger. To ensure that the straws stay in place, tape at the top and bottom of the box. Stand the box up so that all four straws (which should be equal heights) are vertical. Using the holes in the honeycomb ball, place a piece of clear double stick tape on the inside of each straw and stick it to the honeycomb ball. The connection won’t be tough enough to hold up to a ton of wear and tear but it should stay in place if it’s moved. For this step, if you don’t have a honeycomb ball, you can always use a regular size balloon instead. Just keep the proportions in mind either way. You want it to be a little larger than the box. Place Easter grass inside along with favorite toys and candies. You can’t go wrong with a few well-placed chicks or bunnies. 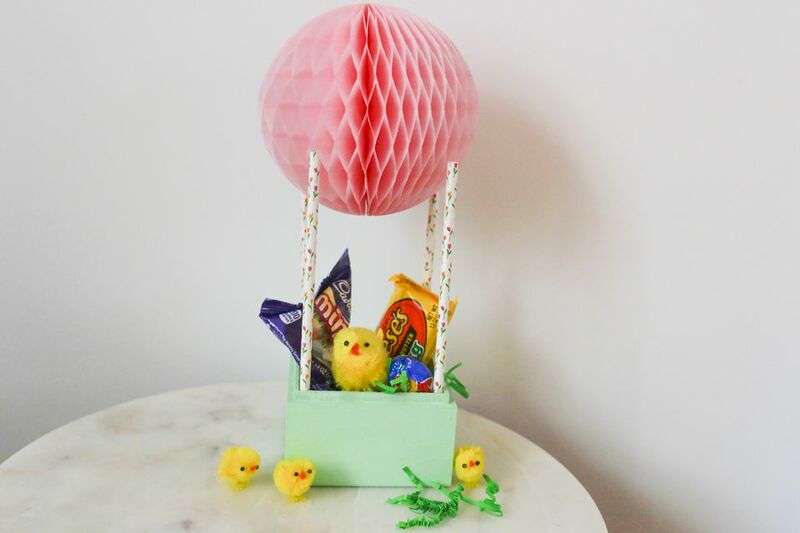 Your little ones will not only love the candy inside, they’ll have a blast seeing this whimsical version of an Easter basket waiting for them in the morning. When all of the candy is gone, use the box to hold keepsakes, school supplies, or as a playful prop to help their imaginations take flight.